Follow this guide Monitor a Webcam, make sure you can view and record video files, make a not of the frame rate you can achieve. after the install I got a warning Not starting motion daemon, disabled via /etc/default/motion ... (warning). -n			Run in non-daemon mode. -s			Run in setup mode. -c config		Full path and filename of config file. -p process_id_file	Full path and filename of process id file (pid file). it will read motion.conf from current directory, ~/.motion or /etc/motion. We need to edit the config file get this thing going. Detailed instructions are here MotionGuideGettingItRunning but i just read through the config file /etc/motion/motion.conf reading the descriptions and changing anything i thought was necessary (which wasn't much). the rather obvious error say i can't access the conf file. confirm my user doesn't have the privs to open the default config file. you will need to logout and login again for the new permissions to apply, then try the setup mode again, this time your user can access the config file with errors. 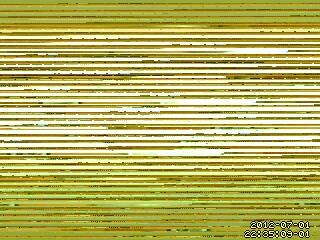 A few seconds of operation with me waving my arms in front of the webcam gave this output to the terminal. Force terminated with ctrl-c. The other thing to notice is that there's also a flash *.swf file created too. This looks a likely candidate for why the data captured is garbage, perhap the palette is wrong? The output shows detection of the colour palettes for the video device. This produced valid pictures although it seems difficult to stimulate a capture. In setup mode this simulated captures but i noticed that occationally things would go haywire and bad frame similar to the above would cause lots of captures. This may be a problem with my set-up or the camera. More testing is needed to discover the cause of the very high number of false alarms / garbage frames captured. But the fundametals seems to be working. Decide what to do with the video you've just captured. This page was last modified on 5 July 2012, at 15:28.